The Life of James First Duke of Ormonde 1610-1688. London: John Murray,	1912. In two volumes. First edition. Tall 8vo., orig. rust cloth, (xvi), 534; 458pp. Name o/w a near fine copy. The Stranger In Ireland; Or, A Tour In The Southern And Western Parts of That Country, In The Year 1805. London: Printed for Richard Phillips, ....	1806. First edition. 4to., recently rebound with tan calf spine, marble boards, raised bands, blindstamped decoration in compartments, leather label, (xvi), (1)-530, (2)pp.ads. Titlepage has been professionally reinforced along the outer edge, tear on p/ vii/viii has been professionally repaired, some light scattered foxing but in fact a near fine copy. Instructions For The Small Farmers of Ireland, On The Cropping And Culture of Their Farms By.....Recommended by The Royal Agricultural Improvement Society of Ireland. Sm.8vo., cont. self-wrappers which have been reinforced by contemporary paper along the spine which makes it impossible to tell if it was issued in self wrappers or whether it is disbound, (36)pp. A nice copy. Discovery of the Tomb of Ollamh Fodhla (Ollav Fola) Ireland's Most Famous Monarch and Law-Maker Upwards of Three Thousand Years Ago. Dublin: McGlashan & Gill, ....	1873. First edition. Tall 8vo., orig. green cloth, (x), 69pp. Lacking the front free e/paper o/w a near fine copy. COYNE, J. Stirling, N.P. Willis, Etc. London: Virture & Co.,	nd. (1842). Two volumes bound in one as issued. 4to., orig. green cloth with decoration in gilt and black on the covers, elaborate gilt on the spine, (iv), 124, (iv), 108pp. Bookplate, two plates supplied from another copy, one has been trimmed so the margins are approx. 1" less, some scattered foxing and slight browning in the margins of some plates, light wear to the foot of the spine but in fact a better than very good, attractive copy. New York: Facts on File,	(1983). First edition. Sm.4to., cloth, 256pp. Fine in d/w. Dublin: Sealy, Bryers and Walker,	1904. Sixth edition. (so stated). Square 12mo., orig. light blue cloth, 116pp. Near fine. The Irish Question. I. History of an Idea. II. Lessons of the Election. 8vo., orig. yellow printed wrappers, (58), (6)pp.ads. A fine copy. A History of the Siege of Londonderry And Defence of Enniskillen, In 1688 and 1689, With Historical Poetry and Biographical Notes, & c. By....The Battles of the Boyne, Athlone and Aughriim, the Siege and Capitulation of Limerick by Lord MacCaulay. With a Brief Introduction by the Rev. W.M. Punshon. Toronto: Maclear & Co.,	1869. First Canadian edition. Tall 8vo., orig. brown cloth, xvi, 319, (1)pp. ads. Spine and perimeter of covers very slightly faded o/w this is a fine copy. Ireland Its Places of Beauty Entertainment Sport and Historic Association. London: George C. Harrap,	(1927). "The Kitbag Travel Books." Sm.8vo., orig. green cloth, 278pp. Very good. The Fair Hills of Ireland. With Illustrations by Hugh Thomson. Dublin: Maunsel and Co.,	1906. 8vo., orig. medium green cloth with elaborate decoration in gilt on the upper cover and spine, 416pp. Ink stain on the lower corner (about 1 square inch) from pp.325 onwards, not affecting text o/w a nice copy. New York: Frederick A. Stokes, 1937. First U.S. edition. Auburn and Buffalo: Miller, Orton & Mulligan,	1854. 8vo., orig. cloth, (viii), 216pp. Spine faded o/w a near fine copy. Letters and Leaders of My Day. New York: Frederick Stokes,	1929. In two volumes. First U.S. edition. Tall 8vo., orig. green cloth, 356; 357-678pp. Fine. The Origin and History of Irish Place Names. (First Series). WITH: The Origin and History of Irish Place Names (Second Series). Dublin: McGlashan & Gill,	1875. Fourth edition of the First Series. First edition of the Second Series. With a presentation inscription from the author on the e/paper of the Second Series. 8vo., orig. green cloth with a small circular gilt decoration on the upper covers, xviii, 593, (2)pp.ads; viii, 509, (3)pp.ads. Inner front hinge of volume two cracked, some minor rubbing o/w near fine. London: Edward Arnold,	1893. First edition. Tall 8vo., orig. green cloth, (xii), 306, 16pp. ads dated "November 1893." Inner hinges cracked, spine slightly cocked o/w very good. W.R. Le Fanu, younger brother of novelist Sheridan Le Fanu, wrote these reminiscences late in his life and it was his only work. He hoped to "jot down some recollections of my earlier days, and to publish some of the Irish stories which from time to time, in my long life, I have heard." 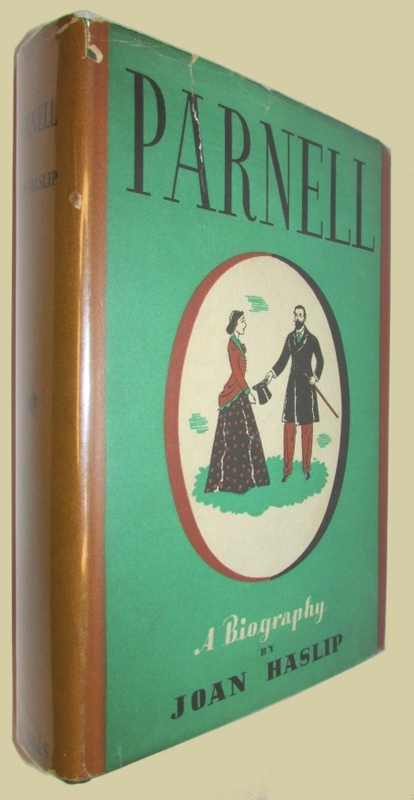 Le Fanu covers a wide range of topics, from the more serious; political problems to the lighter topics of Irish peasant life, "fairies" and the Blarney Stone to name a few. The Leaders of Public Opinion In Ireland: Swift--Flood--Grattan--O'Connell. London: Longmans, Green and Co.,	1871. A New edition, revised and enlarged. 8vo., orig. cloth, xxiv, 320, 12pp.ads dated "April 1885." Near fine. The Companion Guide to Ireland. London: Collins,	1973. First edition. 8vo., cloth, 480pp. Fine in d/w. Sunny Memories of Ireland's Scenic Beauties. Killarney. Dublin: Published and Photographically Illustrated by F.H. Mares,	1867. First edition. Sm.4to., orig. green cloth with gilt decoration on the upper cover, A.E.G., (66)pp. recto only. Mark from the removal of a bookplate, some very minor wear to the spine ends o/w a near fine copy.